Optic Nerve Tumors are quite uncommon. The usual reasons for these patients to be sent for consultation include diminished or complete loss of vision on one side, proptosis (protrusion of the optic globe (eyeball) and a change in facial appearance. Diagnosis is made once an MRI or CT scan has demonstrated an intraorbital (the "orbit" is the eye socket) mass. It can reduce vision. Tumor excision is generally not undertaken, since it will lead to permanent loss of vision in that eye. Surgery is indicated, if the tumor type is in question and the tumor is extending intracranially to involve the Optic Chiasm (the extension of the Optic Nerve inside the skull). In this case, chemotherapy and/or radiation therapy (usually Stereotactic Radiosurgery) is warranted. Right Optic Nerve Glioma (Arrow) in a 28 year old female known to have NF2 (Neurofibromatosis). Compare the size and configuration of the right Optic to Nerve to the one on the patient's Left side. Right Optic Nerve Glioma (Curved Arrow) in the same patient. The Left Optic Nerve (Slender Arrow) is normal. Meningioma of the Optic Nerve within the Orbit, although uncommon, represents one of the most difficult challenges that Neurosurgeons and Neuro-ophthalmologists are called upon to treat. Most Optic Nerve Meningiomas arise form a meningeal layer that shares its blood supply with the Optic Nerve. If surgery is done to remove this tumor, then it usually requires the removal of the blood supply to both the tumor and the Optic Nerve. This results in complete visual loss in that eye. There are very few instances of complete removal of an Optic Nerve Meningioma with PRESERVATION OF VISION. One case was reported by Drs. Joseph C. Maroon and John S. Kennerdell in the American J Ophthalmology 86: 704-709, 1978. In our series of over 150 Orbital Tumor Operations, we have had one similar case of complete removal of an Optic Nerve Meningioma with preservation of vision. Figure 3A (Left): CT Scan of Orbits. The Meningioma involving the Right Optic Nerve (Arrow) was completely removed with preservation of the patient's vision. Figure 3B (Right): Operative Photo of same patient. The majority of the Meningioma has been removed revealing the Optic Nerve. Part of the tumor remains to be resected (Arrow). Although we have made other attempts to preserve vision in Optic Nerve Meningioma patients, these efforts failed to preserve vision in the affected eye. Among the challenges, is the reasonable certainty that the tumor will progress. If it begins at the apex of the orbit near the Optic Canal (the channel through which the Optic Nerve enters the skull, to travel backwards to the Occipital Lobe of the Brain), then early definitive surgery is required, even if it means sacrificing the Optic Nerve and thus the vision in that eye. Failure to do so may well lead to progression of the tumor to cause bilateral (both sides) blindness. Radiosurgery has a place in the treatment, to attempt to control these tumors, particularly in patients who refuse to permit exenteration (removal of all the contents) of the Orbit. There are no easy decisions in the management of this difficult clinical problem. The most common tumor, in our large experience of Orbital Tumors, is a Hemangioma. Hemangiomas are tumors of blood vessels. They can occur anywhere inside the Orbit and usually result in some displacement of the globe. The direction of displacement (up/down or to one side or the other as well as forward) is entirely dependent on the location of the tumor within the orbit. Most of these tumors have an intimate relationship with the Optic Nerve, as well as the muscles in the Orbit that control the motion of the eye. In addition, these tumors almost always have one, or more, Ciliary Nerves intimately involved in the tumor's capsular surface. Sacrifice of these nerves leads, to problems with the function of the pupil on the affected side. The treatment of Hemangiomas of the Orbit is surgery. 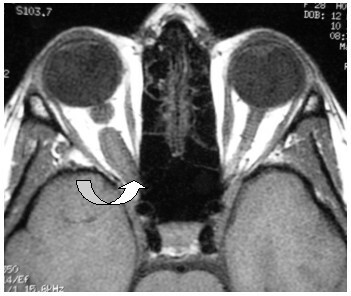 Figure 4A (Left): Operative Photo of a large Orbital Hemangioma displacing and stretching the Optic Nerve (surgical exposure is through a lateral Orbitotomy). Figure 4B (Right): Photo of the Orbital Hemangioma immediately after it was excised. The tumor has been divided to show its "vascular" nature. Dermoid Tumors (which represent 0.3% of brain tumors) tend to be located near the midline. These benign tumors are considered to be "developmental", since they result from retained ectodermal implants that as a consequence of some failure of migration of cells during embryonic development are trapped within the growing skull and orbit and are present at birth. These generally slow growing tumors also tend to be associated with other congenital abnormalities. Orbital Dermoids usually become apparent as a localized orbital "mass" and may produce diplopia (double vision) as it displaces the globe and/or pain. Surgical excision is the only treatment option and is usually curative. In this instance, care must be taken not to spill the contents of the cyst (See Figures 5B and 7 A-C) as the fluid can incite a severe inflammatory response. It is important to avoid leaving remnants of the capsule behind in order to avoid the risk of recurrence. Radiation is not appropriate for these tumors, since the tumor is benign, and will not respond, nor does it prevent recurrence. 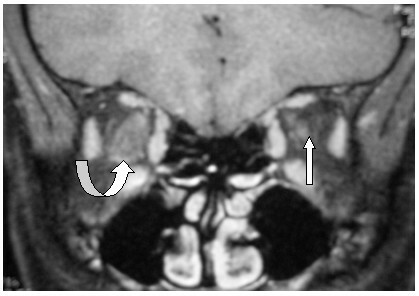 Figure 5A (Left): MRI Scan (Sagittal View). The DERMOID tumor (Uppermost Arrow) is almost the size of the Globe (Longer Left Arrow). The two smaller Arrows point to the eye muscles. The Superior Muscle is directly adjacent to and was found to be adherent to this tumor. Figure 5B (Right): Operative Photo (same patient as Figure 5A). The Dermoid tumor has been partially "isolated" from the surrounding orbital contents. The tumor capsule (indicated by the slender Arrows) has been opened to expose the debris contents. 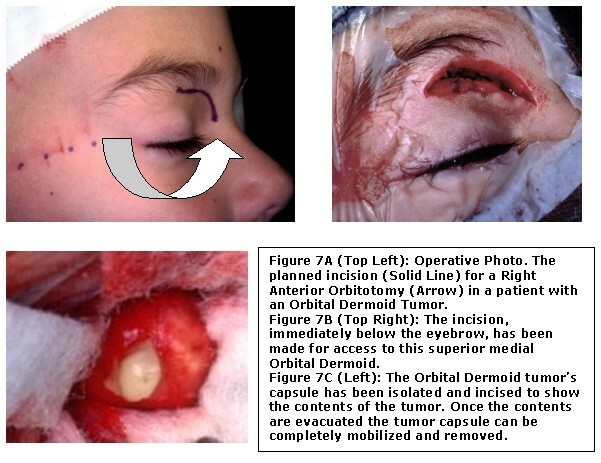 In order to assure complete removal and reduce the risk to injury of the Orbital contents, the tumor's internal contents (Broad Arrow) were removed prior to final dissection of the capsule. There are some other very rare conditions that require attention such as Varices (large dilated veins), the discussion of which is beyond the scope of this paper. Figure 6B (Right): Front photo of patient after Right Lateral Orbitotomy. Some tumors are situated within the Orbit in such a manner that makes an Anterior Orbitotomy Approach more appropriate. An example is presented below in Figures 7 A-C. In this case, an Orbital Dermoid was located in the superior medial Orbit making an Anterior Orbitotomy the most favorable avenue for complete removal of the tumor. The Orbit can be, and is frequently, entered from the intracranial side to remove intraorbital tumors, particularly those at the Orbital Apex, or where the tumor involves intracranial structures, as well as, those of the Orbit such as in some cases of Anterior Skull Base Meningiomas. Skull Base Tumors particularly Meningiomas and Nasopharyngeal Carcinomas often invade the Skull Base as well as the Orbit. We often simultaneously perform a Craniotomy together with Anterior or Lateral Orbitotomies in conjunction with our Craniofacial Plastic Surgeons. These are generally quite extensive operations undertaken by our Skull Base Tumor Group.